The Taylormade M4 Irons with RIBCOR™ technology take iron face flex to a new level. Buy the Taylormade M4 Irons from Just Say Golf and you'll get the hottest iron face available. RIBCOR improves the consistency of the face flex in a way previously unseen. The result is dramatically improved distance consistency and ball speed. The M4 Irons are Taylormade's longest irons. Returning technologies in the 2018 M4 Iron are the highly successful Speed Pocket™ which allows the face to flex on shots hit low on the face to dramatically improve ball speed. Taylormade also returns the Inverted Cone™ face design which creates an incredibly large high COR area, or sweet spot. The M4 irons are long, accurate and have a very large sweet spot. The M4 Iron is about combining distance and accuracy, not just creating distance. Buy the M4 Irons and you get the best of both worlds. A Fluted Hosel removes weight from the hosel allowing it to be repositioned low in the clubhead for easier launch. The Taylormade 360° Undercut saves weight in the back of the clubhead and allows for a deeper center of gravity. 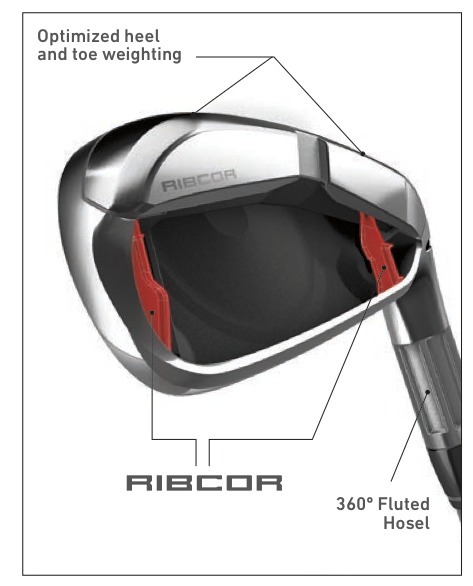 RIBCOR stabilizes the perimeter of the golf club head, localizing the face flex to the effective hitting area. This way, less energy is lost to the flex of the frame and more energy is transferred back to the ball. Enhanced Club Rigidity also mitigates shots hit wide because of "toe-flex" when the ball is hit on the toe of the club, resulting in a tighter shot dispersion. Extreme Heel and Toe Weighting make the M4 very stable on shots hit outside of the center, resulting in more accurate shots. Taylormade's Ultra-Thin Leading Edge allows for more flex in the Speed Pocket to further enhance ball speed on shots hit low on the face. 2-year, manufacturer's warranty on all Tayloramde golf clubs. I tested the M4 irons at a local shop and found that the Ribcor design definitely improves the performance of balls I hit on the toe of the club and they felt a lot better too. Less vibration and better distance. Looking forward to playing them this season. I ordered over length, so I'll be out on the course in a week or so.